This BMW 6 Series has a dependable Twin Turbo Premium Unleaded V-8 4.4 L/268 engine powering this Automatic transmission. VERMILION RED, NAPPA LEATHER UPHOLSTERY, M SPORT PACKAGE -inc: Increased Top Speed Limiter, Without Lines Designation Outside, Shadowline Exterior Trim, Wheels: 19" x 8.5" Light Alloy (Style 351M) Double-spoke, Aerodynamic Kit, LED Fog Lights, M Steering Wheel, M Sport Package (337), EXECUTIVE PACKAGE -inc: Front Ventilated Seats, Contrast Stitching, Instrument Panel w/Leather Finish, Head-Up Display, Soft-Close Automatic Doors, Ceramic Controls, ENHANCED USB & BLUETOOTH W/SMARTPHONE INTEGRATION, COLD WEATHER PACKAGE -inc: Ski Bag, Heated Steering Wheel. Carfax One-Owner Vehicle.This BMW 6 Series Comes Equipped with These Options ACC STOP & GO + ACTIVE DRIVING ASSISTANT, Wireless Streaming, Window Grid Diversity Antenna, Wheels: 19" x 8.5" Star-Spoke (Style 367), Valet Function, Trunk Rear Cargo Access, Trip Computer, Transmission: 8-Speed Sport Automatic w/Shift Paddles, Transmission w/Driver Selectable Mode and STEPTRONIC Sequential Shift Control w/Steering Wheel Controls, Tracker System, Tires: P245/40R19 All Season Run-Flat, Tire Specific Low Tire Pressure Warning, Systems Monitor, Sport Leather Steering Wheel w/Auto Tilt-Away, Speed Sensitive Rain Detecting Variable Intermittent Wipers w/Heated Jets.Living In The Fast Lane Doesn't Mean Compromising On Quality with This BMW 6 Series 650i xDrive Carfax reports: Carfax One-Owner Vehicle. Import Auto Sales graded the Overall Condition of this vehicle as Excellent. Non-smoker vehicle!The Experts' Verdict...As reported by The Manufacturer Summary: With 3 unique body styles to choose from this captivating vehicle will be sure to turn heads but be quick as you may miss it. Choose from the 2 door Coupe, the 4 door Gran Coupe, or the convertible with a soft top that opens in a mere 19 seconds. Performance wise you can take control of a 3.0L Twin-Turbo 6-cylinder that produces 315hp and peak torque of 332lb-ft kicks in almost immediately at 1400 rpm. The other option is a 4.4-liter TwinPower Turbo V8 delivering 445hp and 480 lb-ft of torque. With the intelligent Auto Start-Stop function the engine can automatically turn off when it's not needed, and restart when it is to reduce fuel consumption. All body style options feature an 8-speed Sport automatic transmission making the most out of engine efficiency. All options also have the BMW xDrive all-wheel drive system available as well. Inside the new iDrive 4.2 navigation system showcases an optimized menu display with state-of-the-art technologies, like advanced real-time traffic data. BMW Apps, part of ConnectedDrive, lets you access Social Networks, music PlugIn and Video Playback through your iPhone, and see them on the Display screen (requires Navigation). The optional Bang & Olufsen High-End Surround Sound System features 16 perfectly integrated loudspeakers that deliver a rich sound for your commute. 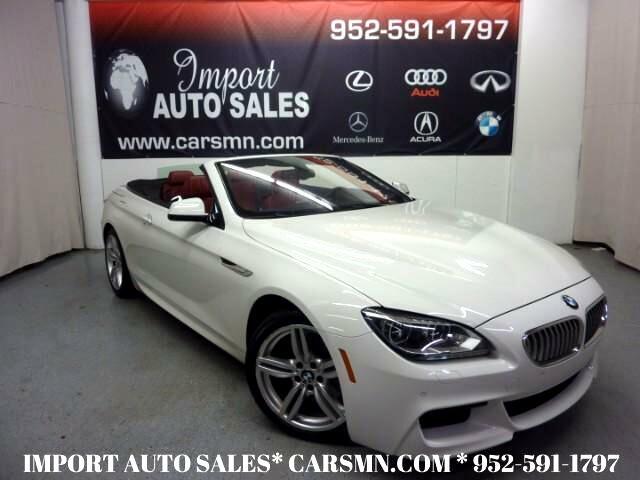 Visit Us Today For a must-own BMW 6 Series come see us at Import Auto Sales, 730 Florida Ave S Golden Valley, MN 55426. Just minutes away!Inquire Online or Call Us at 952-591-1797 Great Financing is Available and Trades are Welcome!! Message: Thought you might be interested in this 2015 BMW 6-Series.